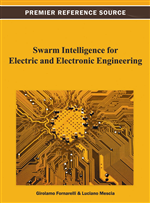 This chapter is intended to describe the vast intrinsic potential of the swarm-intelligence-based algorithms in solving complicated electromagnetic problems. This task is accomplished through addressing the design and analysis challenges of some key real-world problems, ranging from the design of wearable radiators to tumor detection tools. Some of these problems have already been tackled by solution techniques other than particle swarm optimization (PSO) algorithm, the results of which can be found in the literature. However, due to the relatively high level of complexity and randomness inherent to these problems, one has to resort to oversimplification in order to arrive at reasonable solutions utilizing analytical techniques. In this chapter, the authors discuss some recent studies that utilize PSO algorithm particularly in two emerging areas; namely, efficient design of reconfigurable radiators and permittivity estimation of multilayer structures. These problems, although unique, represent a broader range of problems in practice which employ microwave techniques for antenna design and microwave imaging. The inherent random nature of the key variables of the problem. The large number of unknowns as compared to the available information. The necessity of expeditious solution discovery due to the ultimate real-time nature of the corresponding application. The outline of this chapter is as follows. In the first section, PSO algorithm is introduced, and several modifications to the conventional format of the algorithm are presented and compared in terms of the final result accuracy and optimization cost. In addition to the results presented in (Modiri, et al., 2011), this section brings together the other discoveries regarding PSO, which are presented in the literature, such as those introduced by (Nakano, et al., 2007; Clerk, et al,. 2002). A good list of the articles in this area can be found in the reference list of (Modiri, et al, 2011). When studying optimization algorithms, it is important to bear in mind that, in general, there are two approaches one may take. The first approach is dedicated to a suitable solution found expeditiously, whereas the second approach targets the best possible solution regardless of the optimization time or cost. Given the time-sensitiveness of the emerging electromagnetic problems studied here, we focus on the first approach. Both real-number (RPSO) and binary PSO (BPSO) algorithms are taken into account. In order to rationalize the introduced modifications, well-known benchmark problems are evaluated. This allows us to set the stage for the more challenging problems of later sections. In the second section, based on our studies presented in (Modiri2, et al., 2011; Modiri3, et al., 2011; Modiri, et al., 2010), we illustrate how PSO is utilized in a more challenging (and of course appealing) scenario. In particular, we consider the design of reconfigurable and wearable antennas (Liu, et al., 2005; Jin, et al., 2008). In order to illustrate how PSO as a viable technique enters the picture, let us have a brief description of the problem.